Mud plays out like a lost Mark Twain short story, complete with believably eccentric, well-drawn characters and kids on an adventure in which they learn more than they realize. The film has a true sense of place, and feels like an authentic look at these lives off the Mississippi River on the outskirts of a small Arkansas town. 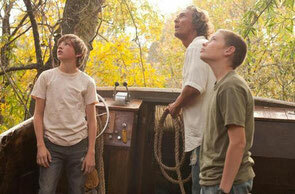 14-year-old Ellis (Tye Sheridan) and his friend Neckbone (Jacob Lofland, who in his first film role looks strikingly similar to River Phoenix circa his coming-of-age adventure Stand by Me) sneak away on Ellis’s skiff to the mouth of the Mississippi where they’ve heard a storm has deposited a small boat on an island. They find the boat without too much difficulty, but discover someone has made a home there. As they depart, Mud (Matthew McConaughey) just sort of appears on the beach, his boots leaving cross prints in the sand from nails hammered into the soles; his chipped front tooth providing a roost for his cigarette. Mud is worn and weathered, but not immediately scary; and measured enough to seem sincere when he tells the boys why he’s hiding from the law and other unsavory characters, and his desperation to reunite and escape with his beloved Juniper (Reese Witherspoon). With a meaningful snake tattoo and pistol poking out of the back of his jeans, he’s the perfect blend of charismatic and potentially dangerous that immediately intrigues the teens. The tales hook Ellis deeply, his idealistic view on relationships being tested by the disintegrating marriage of his parents and confusion on the status of his first crush on “town” girl May Pearl. He’s determined to help save the relationship of Mud and Juniper to validate his belief in genuine affection. As such, the boys bring Mud food and supplies needed to fix the boat so the pair can sail off into the Gulf of Mexico away from their past and into the sunset. 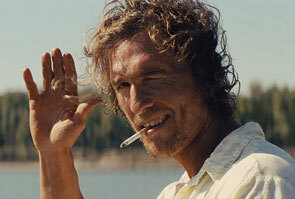 Performances are uniformly solid, with Sheridan and McConaughey standing out. The only exception is, perhaps surprisingly, from Witherspoon who with limited screen time fails to bring any type of nuance or color to Juniper, a centerpiece of the dramatic tension. Much stronger supporting roles are filled in by Sam Shepard as Tom, Ellis’s across-the-river neighbor who has a past with Mud; and Michael Shannon as Neckbone’s uncle Galen who dives for pearls in a helmet fashioned from an old oil drum. Writer-director Jeff Nichols gets several of these little details just right, from the oil-drum-helmet to Ellis’s slightly-too-short jeans and Neckbone’s hand-me-down Fugazi t-shirt. Similar to his 2011 film which I loved, Take Shelter, he obviously cares about his subject matter and takes time to develop the characters and their story. And there are a lot of characters to keep tabs on that are either in the middle of the action or buzzing around the periphery. A deliberate pace almost pulls you out of Mud in spots as a little too much time is taken to let the images and story soak in when not necessarily needed. While that same pacing worked in Take Shelter, it was a more poetic film open to interpretation whereas Mud is more literal. It really presses its 2-hour-plus runtime and in the end feels like it’s scrambling a bit to tie everything up after the climax, which is my only real criticism of the film. Despite it being a tad too long and then waiting to hurry-up at the end, Mud pays off with a subdued, yet moving narrative that sorts through the grime and murky waters of relationships without providing concrete answers. Because there aren’t any; only temporary resolutions to get you through to the next conflict.